Hog Roasts Leeds and Leeds Hog Roast Catering. Leeds BBQ Caterers. We are a family run Leeds Hog Roast Caterers, proud of the food and the quality of it and have received a number of awards in recognition. Our Leeds hog roasts are winners of the prestigious Good Pig Award 2012 our free range, slow roasted Leeds hog roast are chosen and bred in Yorkshire for quality and taste. Hogs that produce the most amazing lean meat increase the flavour and tenderness whilst making the best crackling around. This assures that our slow roasted pulled pork will be the best Leeds hog roast you will have ever tasted! 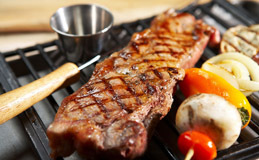 Barbeque catering that's perfect for any occasion. We use free range pigs bred near York to produce our quality sausages, and only 100% outdoor reared beef goes into all our handmade burgers. This really is scrumptious BBQ food for any occasion and with a superb choice of menus we are sure to have one that suits your occasion and requirements. "Big Pan Catering" is becoming a very popular choice nowadays. 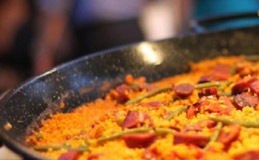 Choose from our authentic Spanish Paellas, traditional Mexican Chilli, our Moroccan Lamb or other exotic menus. Your guests will see the dishes prepared right before their eyes, absorbing all the sizzling and smells of the ingredients coming together in one big pan before being served straight to the plate. Discuss with our Leeds wedding caterers your requirements and tailor our menus together to create something to suit you and each and every bride and grooms needs and taste. For many years we've been supplying a high quality, stylish and professional wedding catering service throughout Yorkshire for wedding receptions and evening celebrations. Our Hog Roasts Leeds team are one of the best in Yorkshire for outside catering in Leeds. Serving Leeds Hog Roasts and all surrounding areas of Yorkshire with our delicious Award Winning free range hog roast and bbq catering for any occasion. 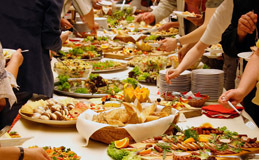 We are a professional Leeds Hog Roast caterers with years of experience in helping to make Birthdays, parties, gatherings and weddings unique and fun through imaginative catering with delicious menus to choose from or customise. Our BBQ and Leeds Hog roast menus are extremely popular, so book our Leeds event caterers now to ensure availability. Leeds Hog Roasts serve most of Yorkshire with our slow roasted free range hog roasts and barbecue catering services. From small intimate garden parties to large corporate events, a hog roast is sure to both make you and your guest’s mouths water with our slow roasted free range tender pulled pork and barbeque catering services. We’ll help to make informal or formal dining a relaxed, enjoyable experience and a complete success! Food is cooked and served right in front of the guests if required, adding a fantastic talking point to any event. It is important for us to give you the type of catering you want for your event, we have pre-designed menus but are always happy to create bespoke packages depending on your catering requirements. Our free range special breed hog roast menus are wonderfully tasty and cooked to perfection at our catering premises near Leeds. Our formal and informal packages are great value, and will help to make your wedding dreams come true. We will continually work to meet your needs, and we’re happy to adapting our caterers menus to your exact requirements for any sort of event, be it a wedding, christening, garden party, informal gathering or business function. Hog Roasts Leeds are here to help make your event special – what better way to do this than through different and delicious food! Our professional, polite uniformed Leeds Caterers have both experience and food hygiene certificates. Our waiters and food service team are always extremely polite, friendly and helpful. Our Chefs and BBQ cooks prepare all our food in clean professional premises which are regularly inspected by the EHO (Environmental Health Office). We maintain a 5 out of 5 start rating and hold full public liability insurance. Our broad range of clients includes Coca-Cola, Warburton’s and many individuals for which we have done wedding and party catering, allowing them to relax and enjoy themselves knowing that they are in the safest of hands, and that we won’t let them down. Leeds is now home to some of the UK’s leading businesses, who in turn require high-end catering as well as friendly and less formal dining solutions. Hog roasts Leeds can offer business catering packages whatever the function, event or type of location. Our talented team of dedicated Hog Roasts Leeds and barbecue caterers work all year round in the Leeds area. The Chefs and food serving crew are passionate about food and creating new and exciting menus using the finest pork and fresh free-range ingredients. 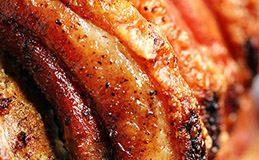 Our crisp free range hog roasts are the closest thing to culinary heaven we can imagine as we bring out the amazing flavours of our elite award winning free range pigs and prepare some of the finest meat for our special barbecue menus, which is why our customers keep coming back to us over and over again for some of the finest hog roasts and barbecue catering food ever tasted in Leeds and right across Yorkshire. No event is too big or too small, and at hog roast Leeds our caterers always go that extra mile to give complete BBQ and hog roast customer satisfaction.